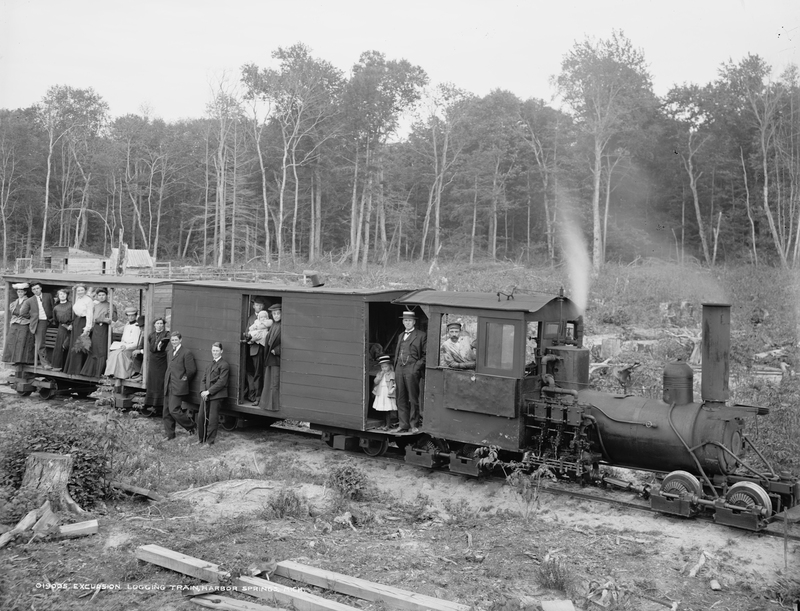 The Hemlock Central (legal name was Harbor Springs Railway) was a 2 ft. 6 in (30 inch) narrow gauge railway which consisted of 13 miles of track from Harbor Springs, Michigan to the lumber camps north of town. 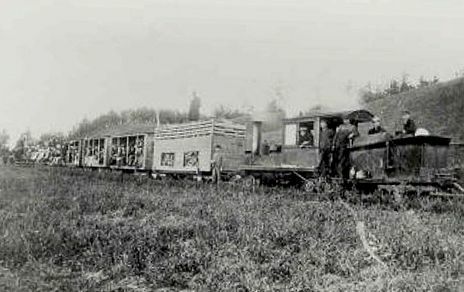 The railroad was primarily a lumber-hauling operation, although summer vacationing tourists paid 25 cents for a ride into the woods. The man standing just behind the cab with the little girl is Ephraim Shay, inventor of the shay locomotive. 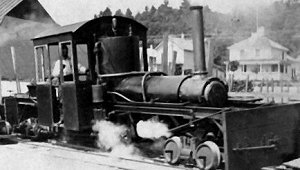 The locomotive pictured is his own design and built by him. Locomotive is the #1 after many years of service and several modifications. 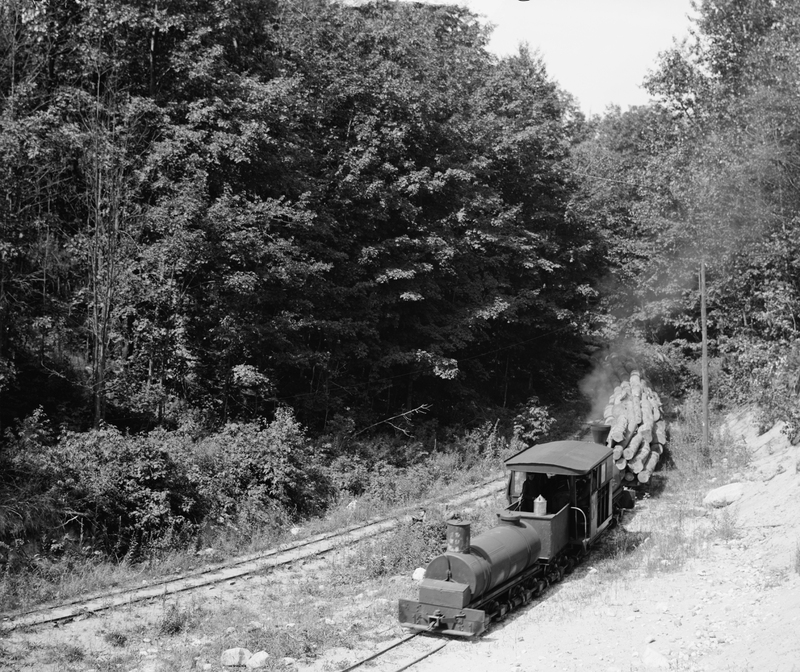 The legal name of the railway was the “Harbor Springs Railway” but it was nicknamed the Hemlock Central because of the great numbers of hemlock trees growing in the area. The name Hemlock Central stuck and was even painted onto some locomotives and rolling stock. Another of Ephraim Shay’s locomotives handles a load of logs for the mill somewhere in the hills above Harbor Springs, MI. 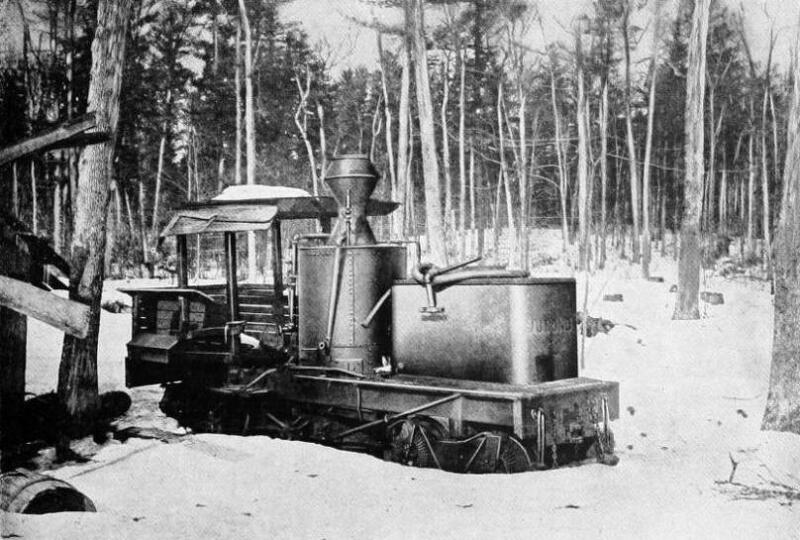 The Harbor Springs Railway was organized on January 7, 1901.The line was owned and operated by Ephraim Shay who invented the Shay Locomotive to haul logs more efficiently for his logging operation. 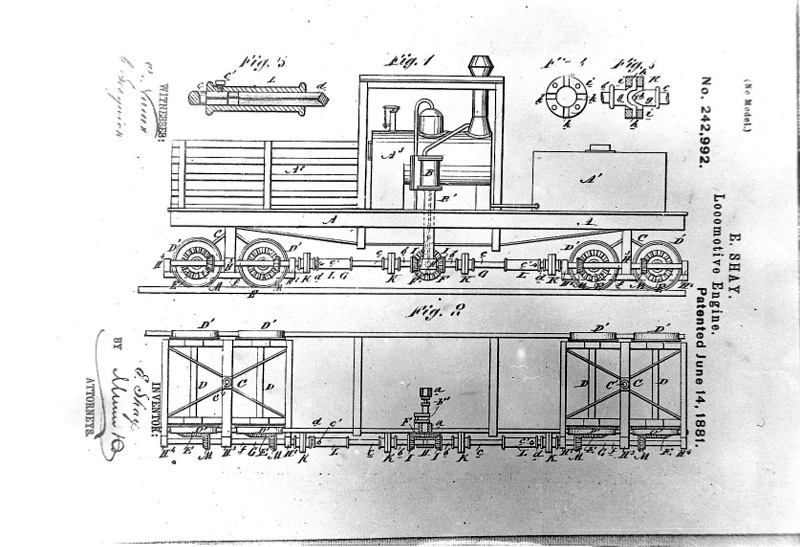 Around 1877 he developed the idea of having an engine sit on a flat car with a boiler, gears, and trucks that could pivot. He worked a few prototype arrangements himself until working with Lima Locomotive Works of Lima, Ohio to a prototype engine in 1880. Shay applied for and was issued a patent for the basic idea in 1881. 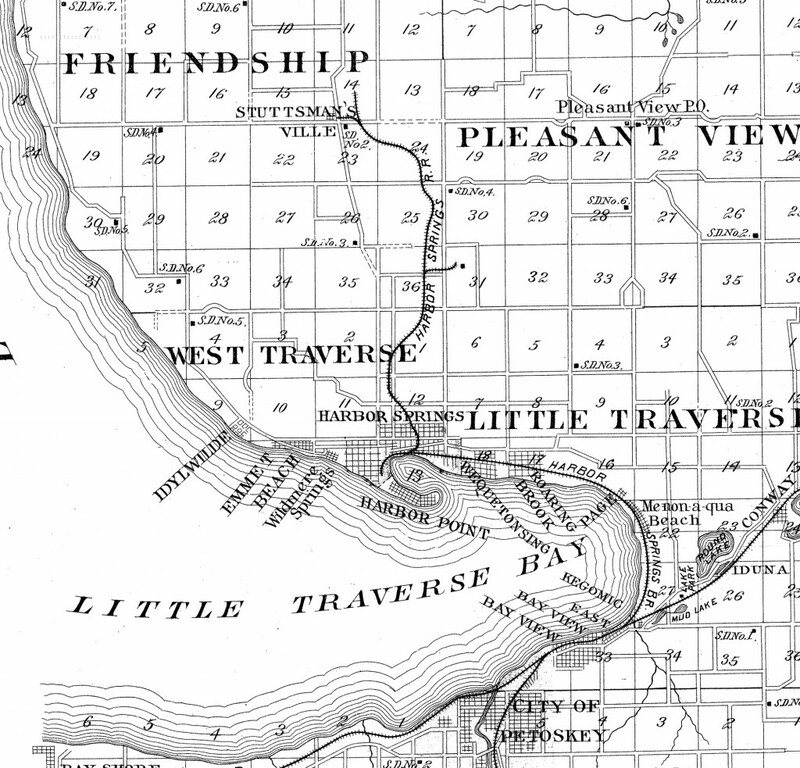 In 1888 Ephraim Shay moved to Harbor Springs on Lake Michigan. He patented an improved geared truck for his engines in 1901. Original drawing for patent by Ephraim Shay. Early advertisement for the Shay design. The March 21, 1902, Railway Age listed the “Harbor Spring Railway – Harbor Springs to Cross Village 20 miles. 3 miles completed 1901.” The line started in Harbor Springs at the harbor near the house and workshop that Ephraim Shay built. 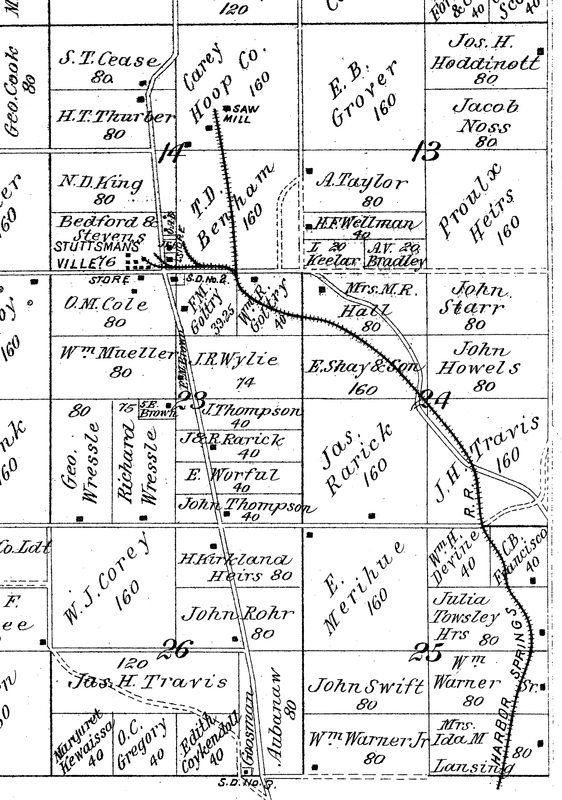 Early on it operated a route of eight miles (1903 ICC Report) to Race Mill. The line was extended later to Carter’s Mill. An ICC report of 1904 reports the line as 13 miles. Branch lines were constructed as needed to reach fresh stands of timber. The railway crossed the Grand Rapids & Indiana at Bay Street in Harbor Springs. 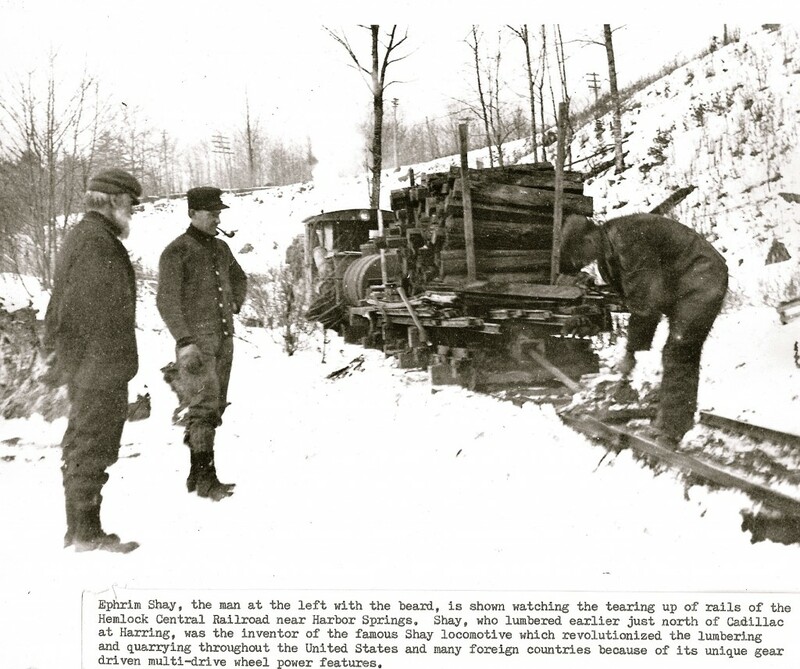 A Michigan Commissioner or Railroads Report (December 1904) indicates a half interlocker appliance at the crossing. Map of Harbor Springs area. 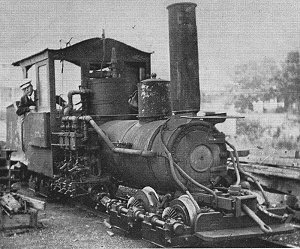 Three Shay locomotives were used and all three were a product of Ephraim Shay’s own design. Although the railroad was officially started in 1902 locomotive #1 (BABY) was built in 1893. 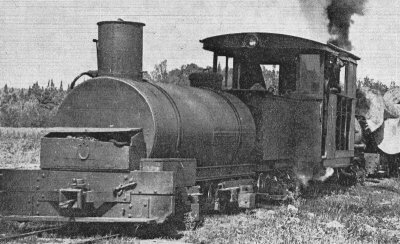 All locomotives were geared locomotives of the typical Shay pattern, but were unusual in that they had no frames, the boiler being the main structural component. The line was built and funded without debt (thanks to Shay’s royalties and licenses from his locomotive designs). 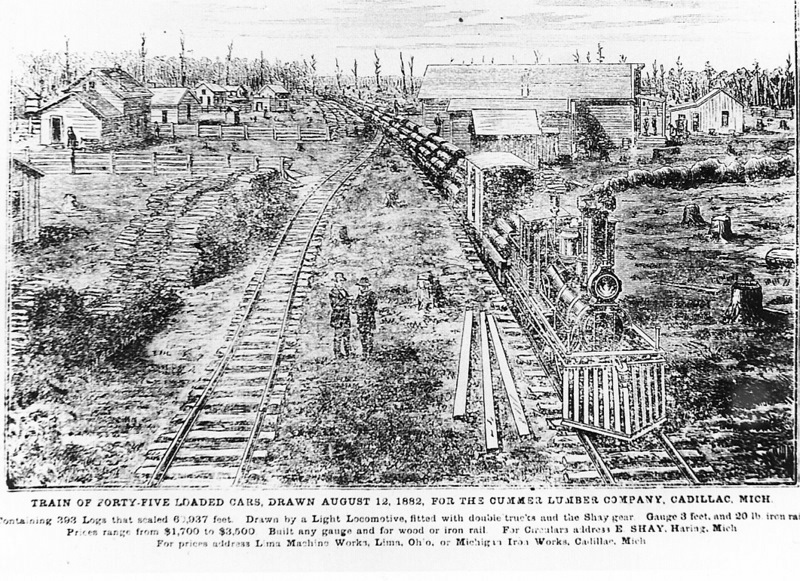 A very light rail of 16 pounds per yard was used in the construction of the railroad. #1 as it appeared when it started work on the Hemlock Central. Ephraim Shay is the engineer. #1 after many modifications and rebuilds. Hemlock Central #3 from rear. The line ceased operations in 1910 and was dismantled in 1912. The company dissolved on January 17, 1912. 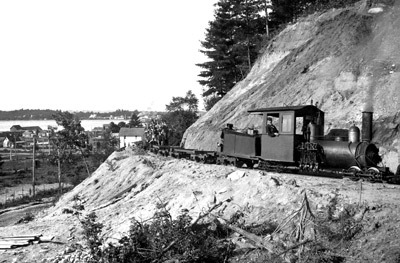 It is interesting to note that a lawsuit was brought against the Harbor Springs Railway about that time, which the railway lost. 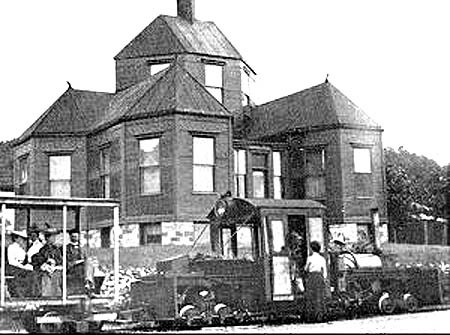 An appeal was filed on January 11, 1912 and on December 17, 1912 the decision was reversed and the Harbor Springs Railway was victorious. A full account of the reasons behind the case can be viewed here. The Hemlock Central passes in front of the home of Ephraim Shay.